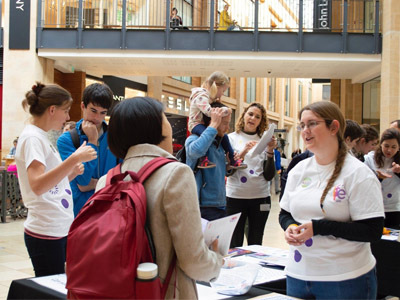 Mutographs scientist Tim Butler explains how researchers at the Wellcome Sanger Institute developed an activity to showcase the work of the Mutographs team to shoppers in Cambridge. In September 2018 some of us on the Sanger Mutographs team had the pleasure of participating in the ‘Life Lab’ event. This is part of European Researchers’ Night, an event all across Europe that brings together scientists and members of the public in order to educate, inspire, and share our mutual love of science. Being lovers of science ourselves, we felt it was important to come up with our own Mutographs-specific activity to show what we have all been working so hard on. We were set up on tables inside the Grand Arcade shopping centre in Cambridge, UK. Over the course of the day we mostly interacted with families out shopping, with occasional groups of teenagers and university students mixed in. 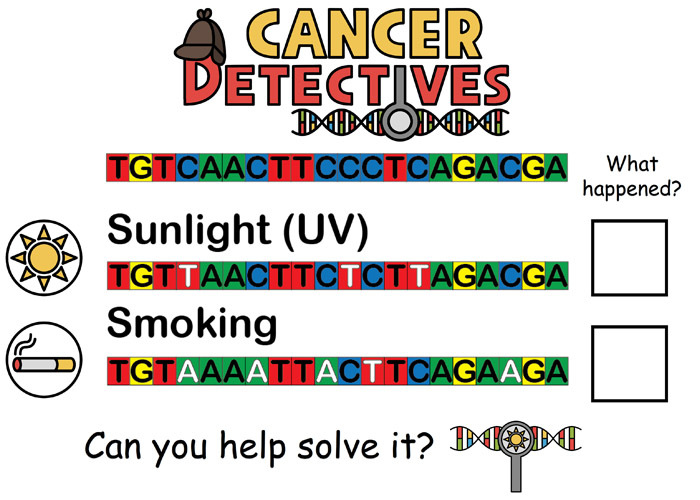 To start, we walked through the basics of DNA, mutations, and exposures, asking people to identify the pattern of mutations caused by ultraviolet (UV) light and smoking. Then people were encouraged to give it a go on their own using specially designed worksheets. It proved sufficiently popular that we ended up making little packets containing the worksheets and stickers, and sent quite a few home with parents. Overall this process worked quite well, with one of us walking the children through the activity and distributing stickers, while the others spoke with the parents about the overall project. 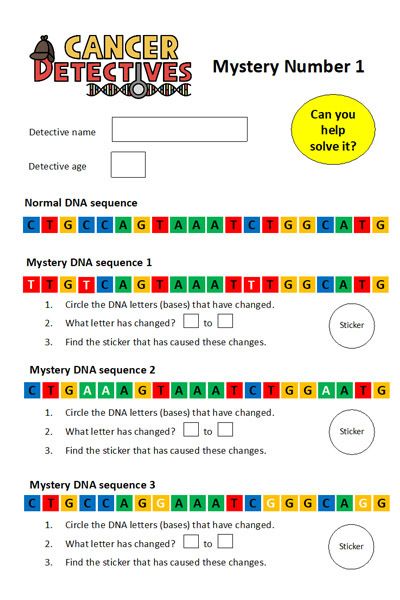 I was impressed by the understanding that many of the children already had of DNA, making introducing the concept of mutational signatures much easier. Many of the parents were also interested in the larger Mutographs project, especially when giving examples of how knowing the exposures could help prevent cancer in the first place. I even got into some very detailed, high-level discussion with university students (asking about sequencing platforms, statistical methods, and sample sizes). I think I can speak for everyone involved in saying we enjoyed ourselves immensely. One of the great benefits we get from this kind of work is experience in talking about our research to people without a professional scientific background. We all spend a lot of time talking about science amongst ourselves, so it is easy to get bogged down in the minutia of our research projects. Having the chance to talk to the public is a great way take a step back and look more at the big picture. This was a trial run for our team – many of us had done public engagement work previously, but, for me at least, this was the first time developing an activity. We are planning on further improving on the basic activity, and expanding on it to better highlight some of the complexities of identifying mutational signatures. We are aiming this activity at secondary school students, so we need to up the degree of difficulty somewhat. Fortunately, the Sanger Institute has no shortage of engagement opportunities, so we will be able to incorporate what we learned for next time. None of this would have been possible without the support of the Wellcome Genome Campus public engagement team, especially Louise Walker. Also special thanks to the European Commission who put on the whole European Researchers’ Night event, and for the continued support from Cancer Research UK.